Want to share a grocery list with someone? 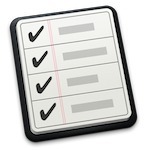 Maybe you have an important to-do list that you need to give a co-worker, or to anyone else with an iOS device or Mac? 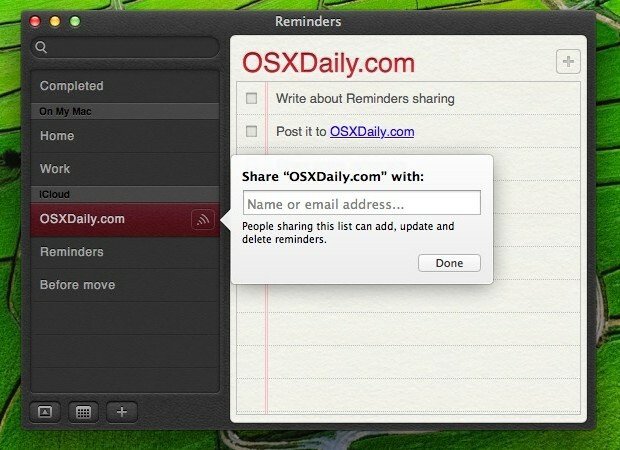 You can now share any such list right from the Reminders app in Mac OS X, or you can even share the lists right from iCloud.com. The shared Reminders will be viewable on the recipients Mac, but perhaps more importantly, on their iOS device, and even location-based Reminders can be shared this way. Note: the lists that are shareable must be stored in iCloud, these are easy to identify in the Mac app under the iCloud subheader within the sidebar. Compatibility is vast, as long as your Mac is running a modern version anything running 10.8.2 or later will work. Shared Reminders have the broadcast indicator highlighted, clicking on that indicator again lets you share the list with more people, or delete existing contacts just by removing their name. Any iCloud list can also be shared directly from iCloud.com too by accessing the web based Reminders tool. Now for the strange part; though shared Reminders are visible on an iPhone, iPad, or iPod touch, you can’t share a list directly from iOS 6. This seems like a fairly significant feature to leave out of Reminders on iOS, but it’ll almost certainly be brought through an update in the near future. Wow not having this sharable from an iphone is a huge fail. Another huge limitation they will hopefully fix, is that if I set a reminder on a shared list with a date/time alert, only I will get the alert popping up on iOS 6… Others on the shared list will NOT get the alert at the specified date and time.